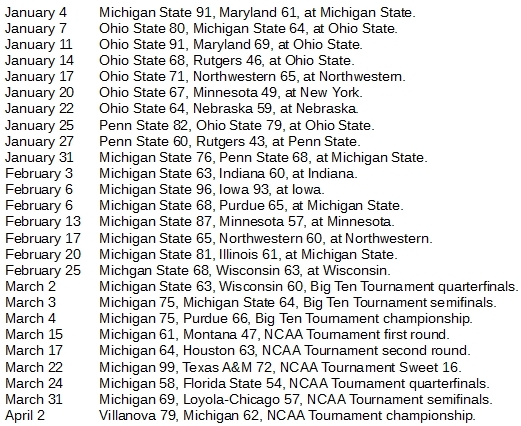 Michigan State took the men's full season traveling men's college basketball championship to the Big Ten season and totaled 20 wins, pulling into the same neighborhood historically as Villanova and North Carolina. 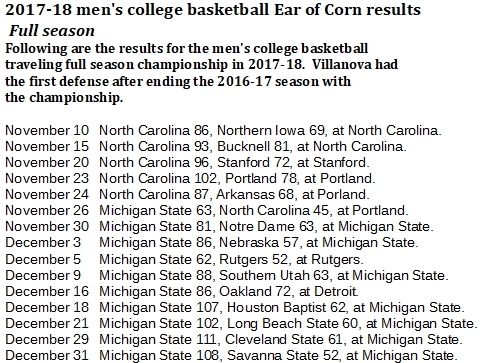 The traveling championship across the entire men's college basketball season entered the Big Ten in a big way as 2017-18 progressed, giving one of its number a chance, perhaps, to challenge Villanova and North Carolina on top of the all-time standings. The contender thusly emerging was Michigan State, which swiped the title from North Carolina in a 63-45 drubbing in Portland on Nov. 26. The Spartans carried the prize for 11 straight games, finally dropping an 80-64 decision at Ohio State on Jan. 7. However, the Spartans regained the title with a 76-68 homecourt win against Penn State on Jan. 31 and held it for another total of nine game before finally falling, 76-64, to Michigan in the Big Ten Tournament semifinals. Michigan then held the title for seven straight games before losing the NCAA Championship Game, 79-62, to Villanova. Villanova and North Carolina were the only teams to win full-season traveling championship games in all three years of the competition through 2017-18. With its win against Michigan, Villanova boosted its all-time win total to 25, leading all teams. North Carolina, which began the season with the prize as last year's national champion, held it for five games, bringing its all-time win total to 23, second on the list. The third-place team now is Michigan State with 20 wins. Who is contending, of course, has quite a lot to do with which conference has a team with the prize when conference play begins. North Carolina gained 17 of its wins in 2015-16, when the prize was in the Atlantic Coast Conference. But Villanova won the national championship from Carolina that year, and took the traveler to the Big East 2016-17, when it claimed 23 of its victories.